TREND’s first two pieces highlighted the company’s increasing collaboration with trade associations in their effort to shape public opinion and the expansion and restructuring of Shell’s Public Affairs division. 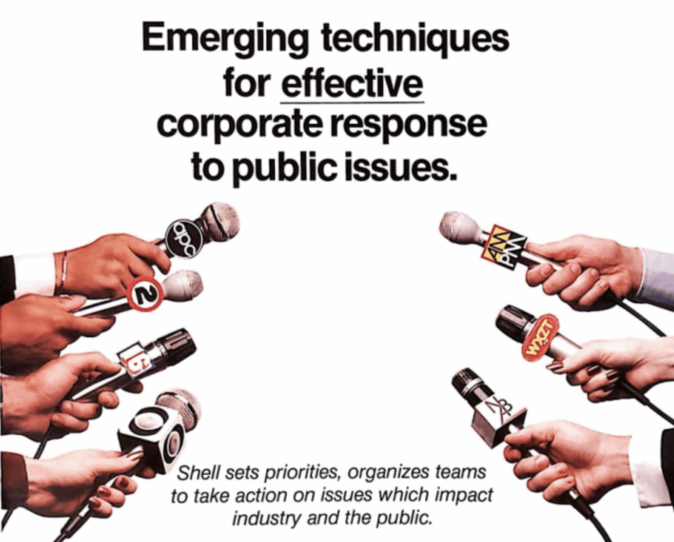 Although the document does not address climate change directly, it illuminates the communication tactics utilized by Shell for environmental issues at large.The strategies outlined in this document to gain “social approval” were implemented for years to come, most notably, in its Profits and Principles ad campaign. Corporate managers wanted to address public issues concerning the company before they reached “the legislative halls and the company [was] faced with an investigation committee or a government agency out to enforce new legislative mandates.” As part of this new strategy, Shell would deploy an “all-out effort to reach opinion leaders and legislators” on priority issues. These tactics ranged from providing “expert testimony before a Congressional Committee” to reaching out to employees, customers, and investors. In order to illustrate how unmanaged public opinion could result “in costly and restrictive regulations,” the publication recounts the consequences of “unfavorable publicity” on railroad derailments, including TV interviews with “employees who fear[ed] for their lives” as track infrastructure deteriorated. Despite efforts by the Chemical Manufacturers Association (CMA), a trade association for the chemical industry, to communicate “the industry’s story on a broad front,” Shell lamented that the railroad derailment issue is “far along” and threatens to “unnecessarily complicate various segments of the chemical industry” with government involvement. One such initiative, a “five-part communications/action plan” named ChemCAP, was conceived by the CMA after studying public attitudes towards the chemical industry. Shell management was actively involved in the plan which targeted policy makers and consumers alike on “major issues” such as worker safety and environmental hazards. And the progression of synfuel technologies in the energy industry, particularly the price and availability of conventional feedstocks.